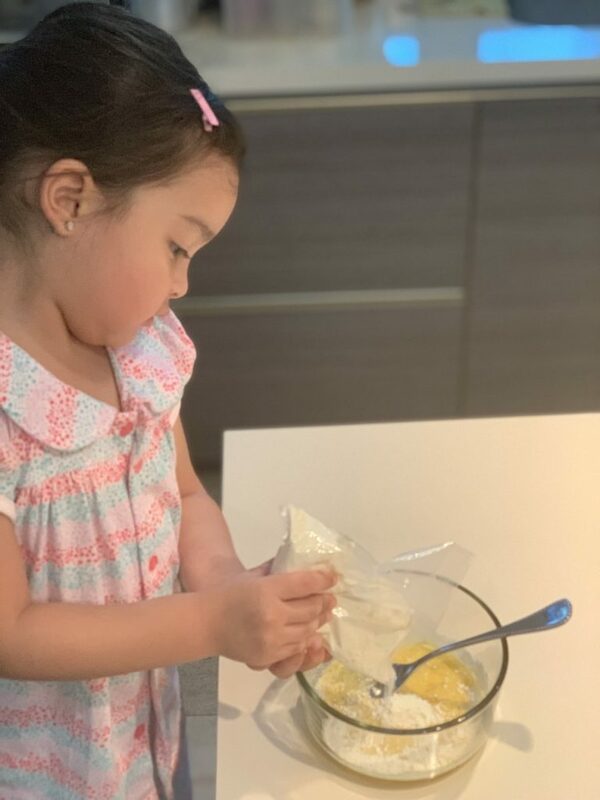 We have a new cook in the Dantes household, nope it’s not Mama Marian Rivera..
She’s smart, she’s beautiful she’s funny and she loves to cook just like her Mama. It’s none other than Ate Zia. Zia definitely inherit her Mom’s love for cooking. Can you guess what Zia is cooking? Zia is cooking Pancakes! Mama Marian shared a photo and video of Zia cooking. Marian posted this photo of Zia seriously pouring pancake mix to her bowl and mixing it. In another post, Marian posted a video of Zia mixing her pancakes. She’s so cute! She cook so neat as well just like her Mama. She just turned 3 years old. She’s so advance for her age. Zia probably watch her Mama cook alot for them. These photos and videos make us want to have a cooking series for Zia through their youtube channel. As you may remember her Daddy Dong told a story about playing cooking with Zia. He said, Zia would often cook spicy nilaga for him. In no time Zia will learn to cook nilaga for real. Next PostMarian Rivera’ substantial advice for self-love.